We've just learned via BlogF1 on Twitter that we're up for an award! There's nothing like being the last to find out, eh? 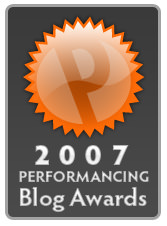 We're lucky enough to have been nominated in the The Best Blog Podcast category in the 2007 Performancing Blog Awards. So far as we can make out, this all kicked off last Thursday and we appear to be one of six nominated candidates, the other five of which seem to be somewhat more significant than our good selves. Alongside us on the shortlist is none other than Jason Calacanis (the guy who started Mahalo.com) and a podcast featuring, amongst others, the founder of WordPress, Matt Mullenweg. Performancing advises nominees to encourage their listeners and readers to vote, so, if you've got 20 seconds to spare please stop by and register a vote for Sidepodcast. There's no need to sign up, just point and click. The closing date is January 10th, which is this coming Thursday. Many thanks to whoever it was who shortlisted us, and to anyone who casts their vote, with extra thanks going to BlogF1 for the heads-up. Thursday Thoughts - Why do you blog?